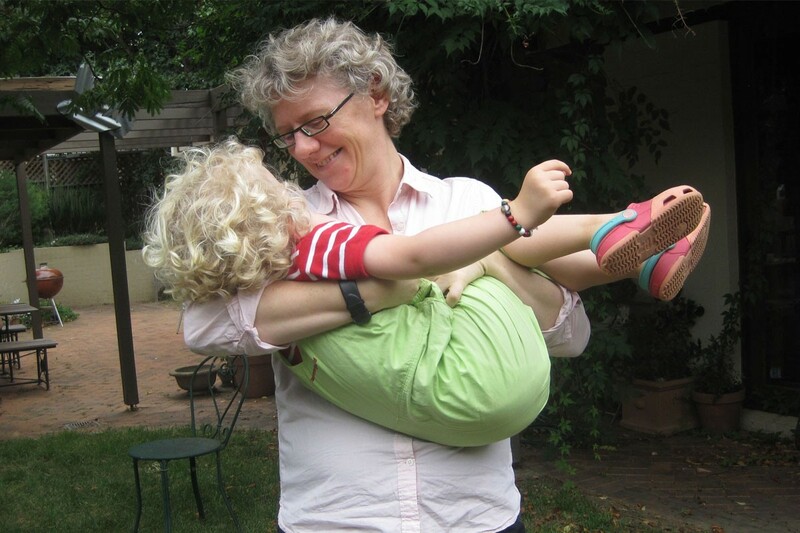 Australian documentary filmmaker, teacher, and podcaster Sophie Harper is a single mom . . . and not by accident. In 2009, Harper moved from her native Australia to Denmark where, for six years, she taught documentary filmmaking at the European Film College while also serving as the school’s vice principal. The day after her 38th birthday, Harper booked an appointment with a fertility clinic to discuss getting pregnant. Like many of us, Harper had dreams of being in a relationship with someone who shared her desire to be a parent. When that didn’t happen, Harper took action and had a baby girl (Astrid, now three) via donor sperm—with zero regrets. In 2015, Harper returned to Australia with her daughter to be close to family and develop her podcast, Not By Accident. Launched on March 31, 2016, the audio documentary series is about choosing to become a Solo Mom and coping with being one. Q: What brought you back to Australia and the podcast? A: I left my job in Denmark knowing it was not a good career move, but the right move personally. There aren’t many jobs in my field, and though I applied for a few, my heart wasn’t in it. I wanted flexibility with my time so I could be the kind of mother I wanted to be. I had some savings, and after a few months decided this was the moment in my life to focus on my creative work. I gave myself a year and hoped it would lead my life in an interesting direction. I have always had creative aspirations: filmmaking, writing, storytelling—but never allowed myself to put them first. This was my moment. Q: Is the podcast a source of income? A: I spent my savings and more while creating the podcast. I was hopeful that if I made something good, personal, and honest, then it would find an audience. Then, when the audience was big enough, I could look for ways to generate income—via sponsorship, advertising, donations, etc. I have a fundraising campaign through the Australian Cultural Fund open until the end of August , and thanks to a feature in the latest episode of Lea Thau’s Strangers podcast (part of the Radiotopia network), my audience has grown to where I am close to generating income from the podcast. Just in time, as my savings has run out! It was a leap of faith—in myself and in podcasting as a medium for creative storytelling. Q: Briefly, how did you land in this? A: I have long appreciated documentary films that unfold over time, where filmmakers follow characters or a story. Before even trying to get pregnant, I decided that I would try to make a film like this myself, of my own story. I bought an audio recorder and have recorded important events and conversations for the past five years. I also recorded some video. Gradually, I decided an audio serial would be the best way to tell the story. This was something I could do by myself without needing a big team or raising money, as in film. I could have total creative freedom to tell the story, make the episodes the length I want, and experiment to find my voice and style at my own pace. Podcasting allows for immediate, free international distribution, and everything came together, making me feel certain this was what I should do. A: Aside from your introduction, episodes two, three, and four give the backstory. Briefly, my mother had advanced cancer. We didn’t think she’d survive. While she was ill, I was also diagnosed with cancer. We both recovered, but the experience was enough to make me reassess my life. I decided to live the life I want from now on—to take action and not passively accept life as it comes. Q: Did being a single mom impact your career? A: I’m figuring that out: I went back to my old job. Before my daughter was born, it was the number-one thing in my life. Now she was the most important thing in my life. I continued working there for 18 months, but it wasn’t as satisfying. I wasn’t as emotionally invested and didn’t feel I could be the teacher I was before. This, combined with the strong pull to have my daughter grow up knowing her grandparents and cousins, pushed me to leave my dream job. Once I’d done that, I didn’t have much to lose and made the decision to follow my dreams to pursue a creative career. I think if I hadn’t had a child I might never have had the courage to jump off the salary treadmill. It’s impacted my career, but I think for the good. Time will tell. Q: When your status shifted from being a single woman to being a single mom, did you feel a shift in your community? A: I’m less available to go out at night, but on the whole, it’s been a positive shift—I think much more so than for coupled parents. The first thing I noticed was that mothers who’d not particularly related to me before now embraced me. Some became like extended family. Most of my friends, single or not, parents or not, welcomed the two of us into their lives as much as they had welcomed me when I was alone, or even more. I think a lot of people feel closer to Astrid because there isn’t another parent. Friends and family are overwhelmingly supportive, emotionally and practically. I try not to ask for much practical support. My daughter is my responsibility, and I don’t expect others to help me unless it’s desperate; but they do, and I’m grateful. Even at child care, I feel they see her as a special child, wanted and loved. I remember feeling judged at the birthing classes—entering a room full of couples as the only single woman. I got some looks and whispers that made me uncomfortable. Also, before she was born, some of the more conservative people in my life weren’t entirely comfortable. But once she was here, that all went away. I’ve felt nothing but support and acceptance. I’m lucky. Q: Were there specific resources that helped you? A: I sought out books and films about single mothering by choice. Books like Choosing Single Motherhood gave me the confidence to know that I was doing the right thing. I enjoyed reading books about other women’s experiences, particularly My Miserable Lonely Lesbian Pregnancy, which is insightful and hilarious. Jennifer Fox’s documentary series Flying: Confessions of a Free Woman motivated me to take action before it was too late. It’s brave, raw, and intensely personal. When Astrid was three months old, I joined a mothers’ group, and though they were almost all in heterosexual relationships, they were a great support during the six months that followed because they had babies the same age and we could relate. Many have become close friends. I suppose the biggest resource was my mother, who supported me through the birth and had us live with her for my daughter’s first year. She fed me three healthy and delicious meals a day. I don’t know how I could have coped looking after my baby without my mother looking after me. A: There have been a handful of moments where I’ve wondered if I am capable of doing this: when I was just back at work and got mastitis from dropping the daytime feeds; my daughter waking several times a night in unbelievable pain due to ear infections that culminated in a burst eardrum; not having a car and having to walk her in the pram to the doctor, child care, the supermarket, through snowstorms, often in the dark . . . while exhausted and sleep-deprived, with intense pressure at work. But I survived, and so did she! Other things: traveling alone with a baby; being jet-lagged with a jet-lagged toddler; both of us having the flu at the same time; packing, shipping, and moving from one side of the world to the other. These are things I don’t recommend, but it’s only a couple of days. Being a single mother is really not as bad as the world makes you think. I wouldn’t change it for anything. A: When she’s not with me, I only do the things I can’t do when she is with me. I can do laundry, cook, shop, and run errands when she’s with me. I can’t write e-mails, work, clean her bedroom, or do anything that requires deep concentration. Don’t waste that precious time! Our house is chaotic and messy, and mealtimes are haphazard. But we have a couple of routines that keep things running: Sundays we buy fruit and vegetables for the week from local markets. Astrid has a lunchbox with separate compartments that ensure she eats a balanced meal at child care. I pack it as I cook dinner the night before so our mornings run smoothly. It surprises me what pleasure I get from packing her a beautiful lunch. She eats better than I do! Q: Of what are you most proud (about yourself) as a Solo Mom? A: That I have produced a delightful, confident, sociable, lovable child while maintaining my own identity and somehow finding the confidence, energy, and drive to pursue my own dreams as well.